I picked up this great book when our local Borders closed down. The book is by the same guy who does the "Ghost" aircraft calendars, and it contains some super photography, mainly of aircraft contained in "The Aeroplane Collection". The author is Philip Makanna, and the book is dedicated to his father, Nicholas Philip Makanna, a WWI veteran. I recommend this book for the superb detail photography of WWI aircraft; the close-ups provide the detail we need as modelers. Thanks Marvin for the heads up on this one, I will be checking the net to see if I can grab a copy. Could you provide us the International Standard Book Number (ISBN) for this title? It makes on-line searches for particular books much easier. Thanks for reminding me about the ISBN...I should have included it in the first place. I have seen this book on Amazon, for much less that the $40.00 MSRP. Does anybody have any recommendations for decent illustrated WW1 aviation books? I've seen millions for WW2, but good WW1 books seem very rare. This one is a good example. It does have the photos of original aircraft (b/w) and those of flying replicas (colour). I can only confirm the opinions above - this book is excellent, beautiful photos, both historical and contemporary, a very interesting text including touching excerpts from poetry (e.g. by C. Lewis), all in all a gem. And I recommend to spend 10USD more and purchase the special edition including a sound CD with over 1 hour of the best music I have ever heard - the sounds of The Ghosts or rather their engines. There are five soundtracks with the sounds of five engines (HS, Mercedes and three Le Rhone rotaries) beginning with the engine starting, taxiing, take off, several fly-overs, landing, taxiing back and switching off. Covers only 4 aircraft: Albatros D.III (Oef), Ansaldo A.1 Balilla, Fokker D.VII, and Spad VII, primarilily in PAF service, but has markings drawings for WWI examples, as well. Particularly interesting is one page with 7 port/starboard sideviews of the D.VII nose panel variations, by manufacturer! Just the thing if the initial WnW D.VII isn't the variant you wanted! 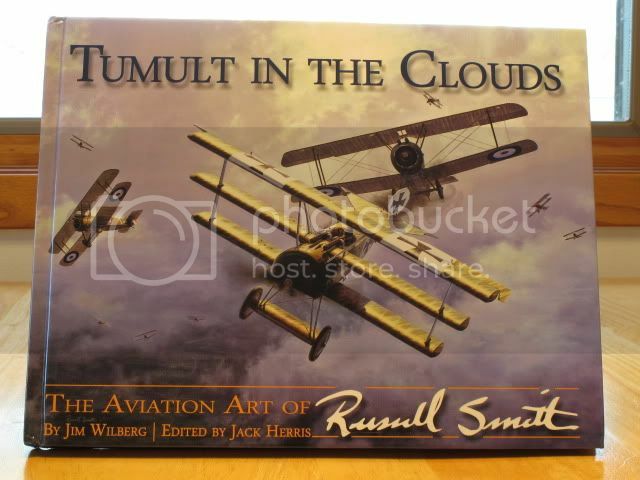 Here’s another from Russell Smith with some of his wonderful art work, photographs from the past and interesting text. A real keeper. I had Russell include a remarque of Lufbery & Whiskey when I ordered mine. The outstanding remarque is now in search of a frame. P.S. I have Philip Makanna’s Limited Edition of Ghosts of the Great War on the way. Osprey's Aircraft of the Aces is full of good colour profiles if thats what you want. 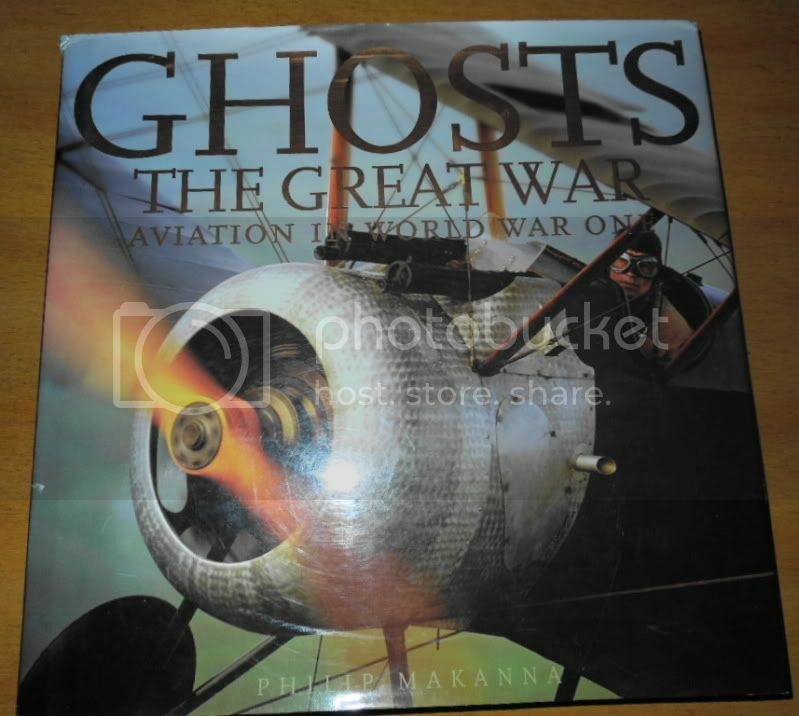 Receive Philip Makanna’s Limited Edition of “Ghosts The Great War Aviation In World War One” yesterday. What a beauty, a feast for the eyes, and what little I read last night the text will be well worth the read. Does one put the CD “The Sounds Of Ghosts Of The Great War” in a player, put on the head phones, then listen to the melodious engine music as one goes through the book? Receive Philip Makanna’s Special Edition of “Ghosts The Great War Aviation In World War One” yesterday. What a beauty, a feast for the eyes, and what little I read last night the text will be well worth the read. Thanks for the heads up, I've ordered it from Amazon.com - as opposed to Amazon.co.uk - for only around £30, including delivery. It's priced at upwards of £50 everywhere else I looked. Just received my book - superb, highly recommended. Beautiful pictures, not many close in detail shots, but dozens of large colour photo's that really bring the planes to life. Interestingly, I ordered it from Amazon.com in the US but it was delivered from Amazon.co.uk in 2 days, even though it's around half the price on the US website. That's great to hear Dekenba. Bonuses always make the joy peek a bit higher.